The Ultimate Tea Diet: How Tea Can Boost Your Metabolism, Shrink Your Appetite, and Kick-Start Remarkable Weight Loss, is written by Mark Ukra who runs a teashop in Los Angeles. Discover a tea that you like. Follow a simple diet plan. Ukra starts by recommending that dieters wean themselves off coffee by replacing it with any kind of tea that they like. Dieters can select from green tea, black tea, oolong tea or white tea and may consume it hot or iced. The main things to remember is that it must be real tea (not herbal), you must drink a lot and avoid adding excessive amounts of sweeteners. L-theanine an amino acid that neutralizes the harmful effects of caffeine and acts as an appetite suppressant. EGCG, which increases the rate and efficiency of fat burning. Dieters are encouraged to eat three meals a day that include a balance of protein, carbohydrate and fat. Portion control is achieved by using the plate method and dieters are advised to use an 8-inch plate so as to avoid overeating. Half the plate should be covered with healthy carbohydrates including fruit, vegetables and whole grains. A quarter of the plate should contain lean protein such as chicken, fish, lean beef, egg white or tofu and a quarter of the plate should contain green or red vegetables. In addition each meal should contain a small amount of healthy fat such as a teaspoon of olive oil or a tablespoon of low fat salad dressing. Dieters are also advised that if they want to have a carbohydrate snack they should always include some protein as well and vice versa. This is to prevent a rapid increase in blood sugar and to stop the carbs being stored as fat. The meal plans include suggested snacks, however, they are not mandatory and should be eaten only if feeling hungry. Lean beef, fat free cheese, fish, egg whites, turkey breast, Boca burgers, nonfat yogurt, brown rice, sweet potato, oatmeal, cream of wheat, pumpkin, popcorn, avocado, olive oil, flaxseed, raw nuts, vegetables, fruit. Cardiovascular and strength training exercises are recommended for their ability to benefit health and enhance general wellbeing. The authors highlight studies that show that tea can actually improve exercise performance and enhance fat burning during exercise. The Ultimate Tea Diet retails at $24.95. Drinking tea may be used to replace the habit of mindless snacking. Increased fluid intake will help to reduce appetite. Includes a 14 day healthy meal plan. May help dieters to give up drinking coffee without experiencing caffeine withdrawal symptoms. Tea may help to reduce blood glucose and cholesterol levels. Certain varieties of teas contain high amounts of antioxidants that may help to reduce the risk of chronic diseases including cancer. Addresses psychological factors involved in eating behaviors. Provides interesting information about tea. May not appeal to dieters who like to drink coffee. May be difficult to drink eight cups of tea every day. Not suitable to dieters who are very sensitive to caffeine. The book includes a healthy meal plan that emphasizes portion control with a selection of interesting recipes as well as a lot of information about the different varieties of tea. Although there may be some benefits to drinking tea in regard to weight loss it is more likely that any results experienced on this program will be due to lifestyle changes such as reducing calories and increasing physical activity. Ukra, M. (2008). 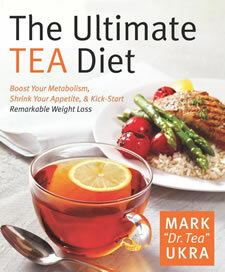 The Ultimate Tea Diet: How Tea Can Boost Your Metabolism, Shrink Your Appetite, and Kick-start Remarkable Weight Loss. HarperCollins.